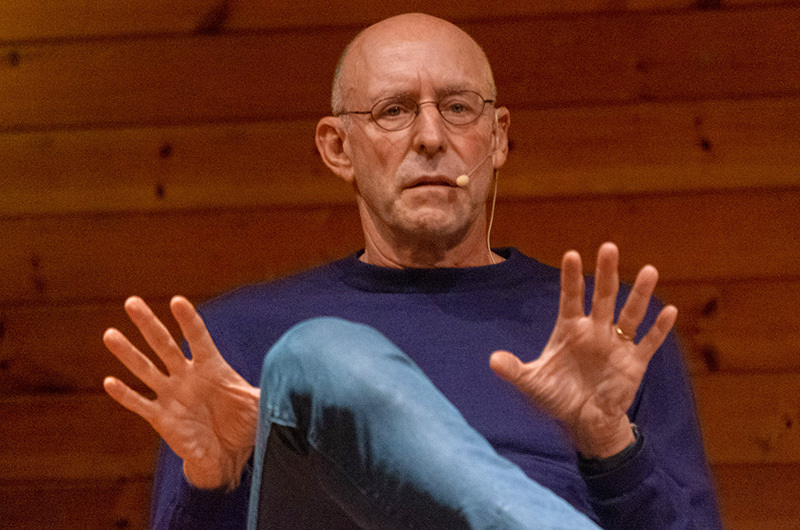 Michael Pollan discussed his new book as part of the Author Series, with Tony Horwitz guiding the way. 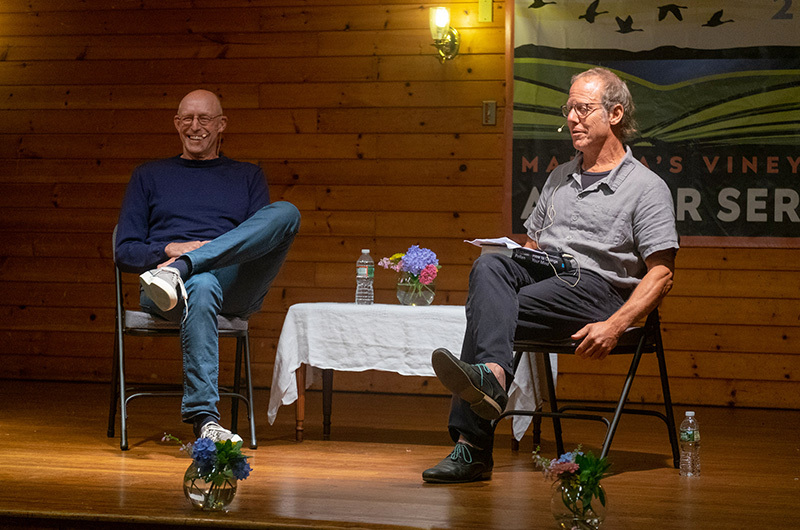 But that wasn’t what Mr. Pollan and writer Tony Horwitz discussed at the Chilmark Community Center on Sunday night as part of the summer Author Series. In an often-humorous interview between Mr. Pollan and his longtime friend, Mr. Horwitz, the author answered questions and shared stories from his new book, How To Change Your Mind, What the New Science of Psychedelics Teaches Us About Consciousness, Dying, Addiction, Depression, and Transcendence. Part history, part philosophy and part self-discovery, the book centers around the science behind psychedelics, particularly LSD, DMT and psilocybin, known familiarly as “magic mushrooms.” The germ for Mr. Pollan’s book came from a New Yorker article he wrote in 2015 called The Trip Treatment. Whereas much of the research from the mid-20th century relied on anecdotal evidence and the enthusiasm of a few militant proponents of the drugs, such as Henry and Clare Luce, Cary Grant, Ken Kesey and Timothy Leary, modern brain-imaging technology has allowed scientists to map and monitor the neural impulses of psychedelic users. The research has shown the drugs’ potential therapeutic benefits, including helping with depression and addiction. That network was the Default Mode Network, which connects the cortex to deeper centers of memory, emotion and sense of self. A researcher at Yale examined the brains of people who had meditated for over 10,000 hours and their imaging looked identical to the brains of people on psychedelics. “It’s a very important part of the brain but also a part of the brain that can torture us,” Mr. Pollan said. He argued that temporarily taking the DMN offline appears to be what’s responsible for the drugs’ therapeutic benefits. When researching for the book, Mr. Pollan called scientists at the National Institute of Health looking for a quotation expressing skepticism or fears about the discoveries. “I couldn’t find it,” he said. Unlike Mr. Horwitz, who jokingly told of his youthful escapades at Lucy Vincent Beach, Mr. Pollan had never experimented with the drugs before writing his book. But he knew he couldn’t write about psychedelics having never tried them himself. Rather than taking the drugs in his house or while in nature, Mr. Pollan underwent what he called “guided trips” during which experts provide music, sleep masks, and wrote down the subject’s verbal utterances. Mr. Pollan’s most transcendental moment came during a high-dosage psilocybin trip. Some trips were worse than others. Mr. Pollan told the story of smoking a high-potency drug extracted from the venom of the Sonoran Desert Toad. Mr. Pollan did say that were psychedelics legal, he would do them every year on his birthday as a form of self-reflection. Until then, Mr. Pollan has decided that he’s taken his last trip. The most aggressive pushback against the book has come from people who believe that consciousness is a cosmic property, and not a function of the brain.